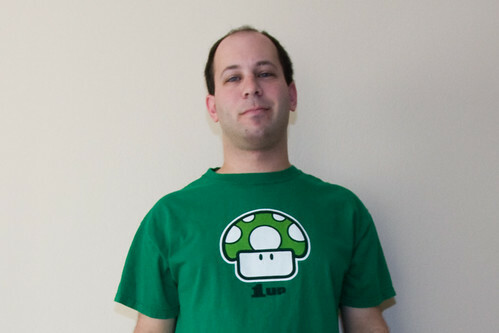 geek and proud - 1up! I’m running out of things to say when I post my new shirt every day. Also, the picture quality is getting pretty bad. I’m not sure why, but I always wake up late and am in a hurry to shoot it in the morning before going to work, so I’m not taking much time on them. Anyway, that’s today’s shirt. Purchase date: October 3, 2007. The first one I’ve worn so far this month that wasn’t bought in 2008. I don’t know why I am as enamored of 8-bit Nintendo shirts as I am, but I probably need to find a better source for babydoll versions. Unfortunately, 80s tees’ female selection is… pretty limited.